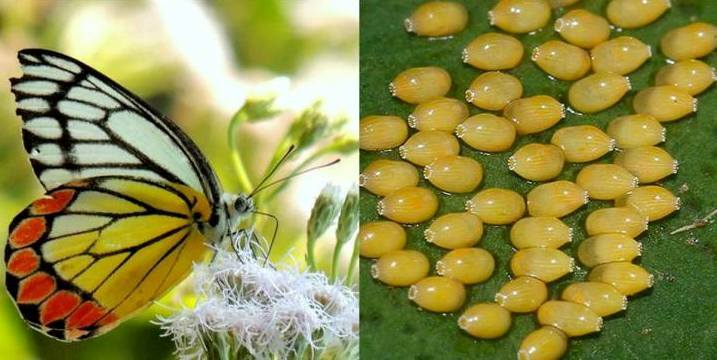 The Common Jezebel (Delias eucharis) is a medium sized pierid butterfly found in many areas of South and Southeast Asia, especially in the non-arid regions of India, Sri Lanka, Indonesia, Myanmar and Thailand. The Common Jezebel is one of the most common of the approximately 225 described species in the genus Delias. Delias eucharis is nomadic in behaviour, and can be found in a wide variety of habitats including temperate hill forest, tropical rain forest, dry open woodland and beach hinterlands. It is a common species in flowery gardens, and commonly visits flowering bushes in towns. The butterfly can be found at altitudes between sea level and at least 1500 m.
The wingspan of both males and females ranges from 6.5 to 8.5 cm.Most species are gaudily patterned in red, yellow, black and white – the colours serving to advertise their unpalatable nature to would-be predators. The Common Jezebel can be distinguished by the shape of the orange red spots on the hind wing. The caterpillars are gregarious in the first few instar. Caterpillars are yellow brown with a black head and have white tubercles from which long white hair arise. It has bright coloration to indicate the fact that it is unpalatable due to toxins accumulated by the larvae from the host-plants.